The two major species of genus Madhuca found in India are Madhuca Indica (syn. Bassia latifolia) and Madhuca longifolia (syn.Brassica longifolia). Mahua is the widely accepted as local name for the fat from both these species. M. Latijolia is a deciduous tree while M.Congijolia is ever green or semi ever green tree. Attains height up to 70 ft. The tree matures and starts bearing 4-8 years, and fruits up to 60 years. The two species are not differentiated in Trade. The kernels are 70% of seed by weight, are seed contains two kernels, having 2.5 cm x 1.75 cm size oil content in latifolia is 46% and 52% in longifolia. In seeds oil content is +36% and protein in 16%. 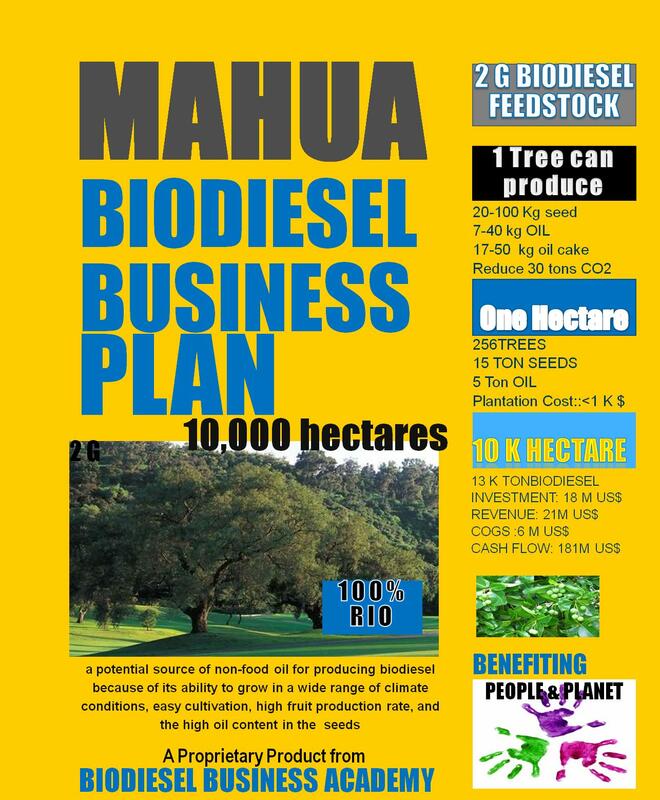 The Mahua biodiesel meets all the three criteria any environmentally sustainable fuel must meet. These are social, technical and commercial. The tree has a potential of enhancing rural income. Being an evergreen variety, it reaches a height of 45-60 feet, and is well adapted to varied weather conditions. With its wide spreading branches and circular crown the tree presents a visually appealing structure. Seed yield ranges from 20-200 kg per tree every year, depending on its growth and development. Being hardy and pest resistant, the tree requires little attention once it has taken root. As a plantation tree, mahua is an important plant having vital socio-economic value. This species can be planted on roadside, canal banks etc on commercial scale and in social forestry programmes, particularly in tribal areas. The drying and decertification yield 70% kernel on the weight of seed. The kernel of seed contains about 50% oil. The oil yield in an expeller is nearly 34-37. The properties of the Mahua Oil were found to be within the biodiesel limits of various countries. Hence the Mahua Oil can be used as a substitute for diesel, for sustainable development of rural areas and as a renewable fuel. The trees will act as sinks for carbon dioxide and, hence, the M.Indica plantation will reduce the amount of this greenhouse gas (GHG) in the atmosphere. The project has many other positive economic, social and environmental impacts: There are income generation opportunities that result from the project like the provision of goods and services to the plantation and its workers. Many studies have shown there is enough land available to produce more food, more feed and more biofuels. Though the discussion of indirect land use change (ILUC) caused by biofuels is not scientifically supported, the Mahua does not causes land use change. Contrary to it Mahua is targeted for marginal lands which are unproductive, often because of degradation as used for reforestation in the dry, saline wasteland. Biodiesel can make a large contribution to the world’s future energy requirements; this is a resource we cannot ignore. The challenge is to harness it on an environmentally and economically manner and without compromising food security. Mahua has attracted attention as pressure mounts to find sustainable alternative fuels to help meet countries' renewable energy targets and cut greenhouse gas emissions, without interfering with agricultural production. Researchers at CJP has honor to establish this untapped resource as alternative source for Bio- Diesel industry of future as Mahua is a strong candidate to contribute significant amounts of biofuel feedstock. CJP estimates the key financial figures for a company’s MAHUA Project over 10 years. Th3e projections include abbreviated income and cash flow statements and a balance sheet.